MySQL to Oracle Database Converter Software helps DBA and software developers to convert bulk database records of MySQL to Oracle database without any modification of database records. Database conversion tool saves converted database records at the user specified location or overwrite the content of existing oracle database according to user requirement. Db migration program works on all versions of MySQL and Oracle. 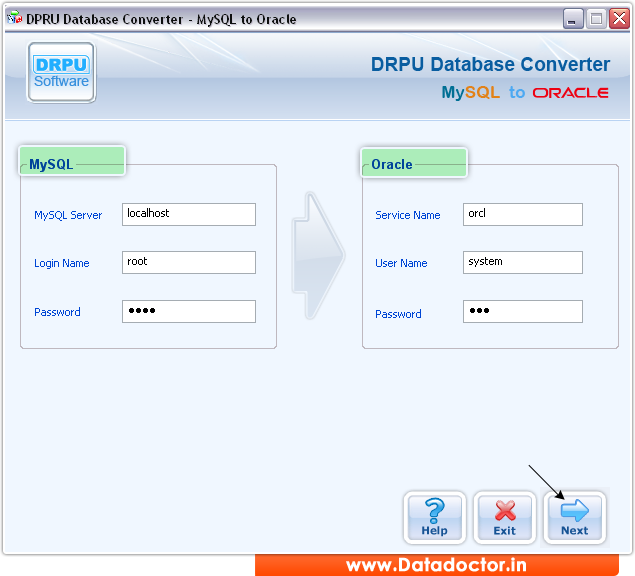 MySQL to Oracle database converter utility automatically convert thousands of database records by the help of inbuilt standard conversion process. » MySQL to Oracle database converter software transfers bulk database records from MySQL to Oracle without any modification of database. » Database conversion program supports entire common MySQL data types and attributes. » MySQL to Oracle database conversion utility smoothly works on entire edition of MySQL and Oracle. » Database conversion program is very useful for large, small and midsized business organization to convert bulk database records from MySQL to Oracle. » Database converter application works on entire types of Windows operating systems.